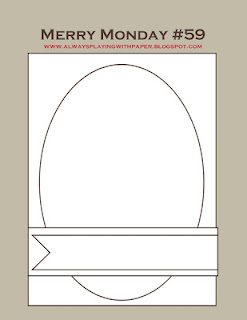 After taking a week off, we are back at Merry Monday! Lesley has another awesome sketch for us this week. I love the combination of the oval shape with the added banner. My oval shapes were cut with the Cricut Art Philosophy cartridge. I then embossed the top panel with a distressed brick background. I popped up my stocking, added a rick rack hanger and fun flock for added texture. A little added bling completes the card! I carried the monochromatic theme to the inside of the card. The large sentiment is from MFT Stamps. Love the soft blue you used...very pretty card and the background in the oval is very cool. Love your card in blue. The brick embossed panel is a great background for the hanging stocking. Love it. I saw your card on the Merry Monday challenge post this morning and was instantly drawn to that brick embossing! It's so perfect with your stocking. Love your blues and the matching inside of the card (I never like to do the insides, but it really does make them so much more special). Thanks for playing with CSAYL. Oh, Sweet Christmas, Allisa, this elegant stocking with the yummy cuff on the white brick with the blue POLKA DOT dp ~ jaw-da'ropping!! So pinned!! Just so lovely Allisa !! Thanks for playing at Crafty Sentiments Designs this week !! Very nice card Allisa, I love the soft blue you used. I love brick wall embossing too. OH MY GOODNESS! I love this--that brick embossing is such a fabulous background for your pretty stocking! Love your card. The bricks and the stocking are just perfect. Adore the brick texture behind the stocking Allisa! Genius design! Hugs! Such a pretty stocking! Love that brick background! Darling card. Love the faux brick with the stocking. Neat inside too. Such a fun stocking and the embossing is perfect! So fun playing with you talented ladies this month! Eine tolle karte in tollen Farben. Mir gefällt auch das Motiv gut. Such a lovely card! Soft all around with the colors and the felt. Wonderful! Thanks for joining in the fun at CSAYL!!! Beautiful card, Allisa! Love the brick embossing behind your stocking and the monochromatic color! Fun card and I love the brick texture for the oval. :) Thanks for playing with my Amusing Challenge this week...I'm really glad you did! Oh wow, what a beautiful card! The soft blue and texture is so pretty! Beautiful card. love embossing background. Great. Love the bricks behind the stocking. This is absolutely fabulous Allisa! Top Notch Allisa, fabulous detail, beautiful card.